Indulge yourself! Secluded accommodations nestled in the back of the Inn overlooking the award-winning gardens provide for a romantic Williamsburg getaway. This enchanting retreat is isolated from the main house and is ideal for a Williamsburg honeymoon, an anniversary, or any special or romantic occasion. 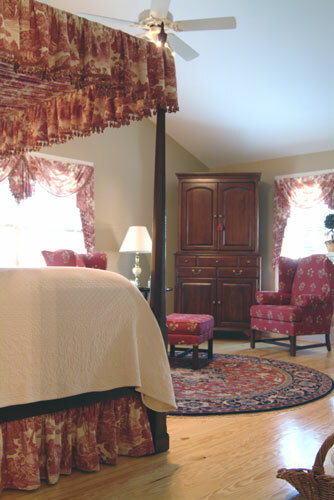 The beautifully decorated, spacious suite (20’ by 20’) features a King-size canopy bed, Jacuzzi tub for two, gas fireplace, vaulted ceiling, hardwood floors with oriental rugs and a sitting area. Additional amenities include cable TV, VCR and CD player. If you are planning a Williamsburg wedding, our Carriage Room is perfect for a romantic wedding night! Two night minimum on weekends. All rates are daily per room for two persons. Arrangements are possible on limited basis for extra person in room -- add $35. 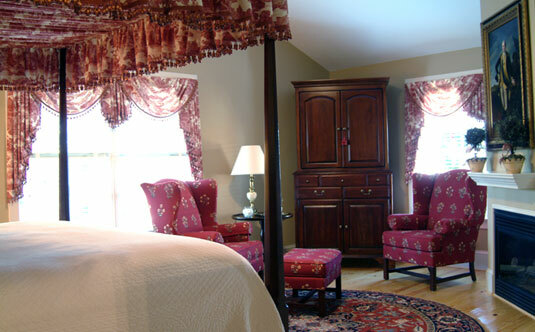 Our comfortable rooms are decorated with tasteful Colonial Williamsburg colors and are enhanced with rich cherry and mahogany furnishings. Each bed is adorned with luxurious Egyptian cotton bed linens. 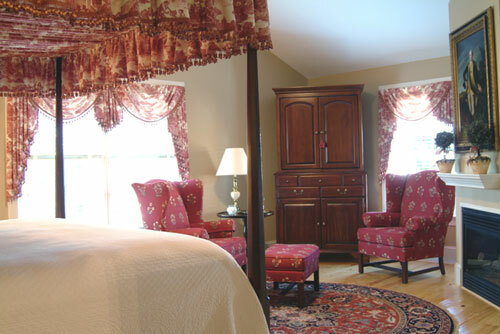 The rooms are named after United States Presidents who attended the College of William and Mary and feature king/queen beds, hardwood floors, Oriental rugs, cable TVs, clock radios/CD players, and private baths--two with whirlpool tubs. The newly renovated, pristine bathrooms highlight all of the modern conveniences, yet each bath maintains its own unique look with features like custom cabinetry accented with marble tops.